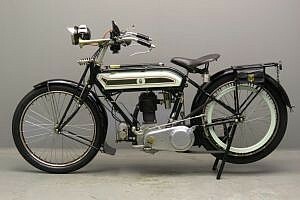 The model H is announced late in 1914 as a logical development of the famous veteran “ Trusty”. 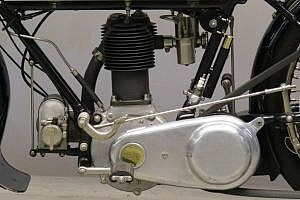 But it isn’t just a 1914 model with a countershaft gearbox: the engine differs from the veteran engine in various ways. It has a single cam wheel with 2 cams instead of separate cam wheels for the inlet and exhaust valve. The casting for the cylinder is entirely new, the valve head diameter is enlarged by ¼ inch and the valves are spaced further apart. 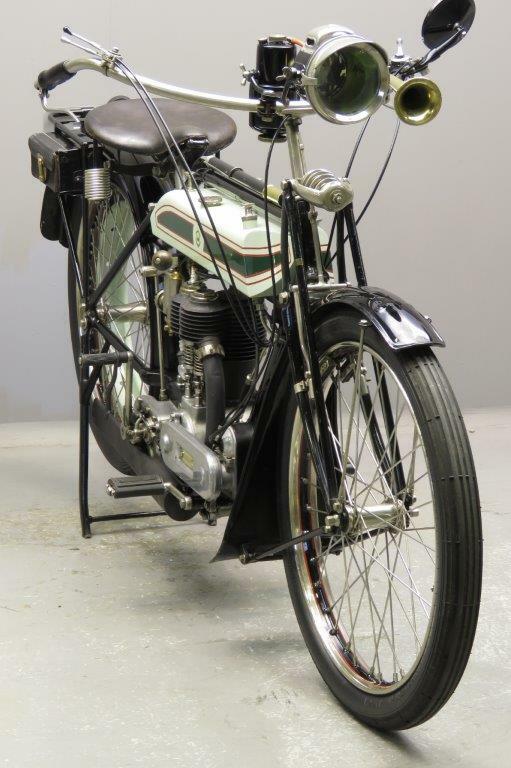 A great improvement over the 1914 style 3-speed hub is the Sturmey Archer countershaft gearbox. 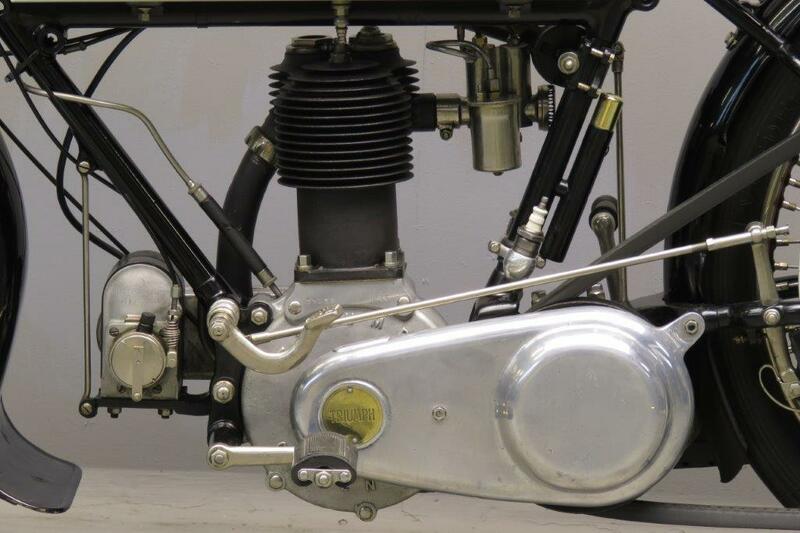 The primary chain drive is enclosed by a neat aluminium cover; secondary drive is by belt. 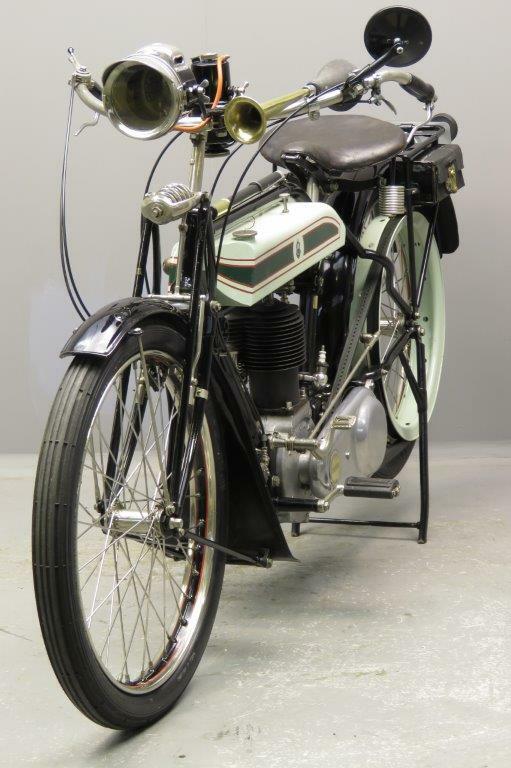 The new model becomes available in February 1915 and most of the production goes to the British Armed forces; in 1918 the army has just over 17,000 Model H’s. 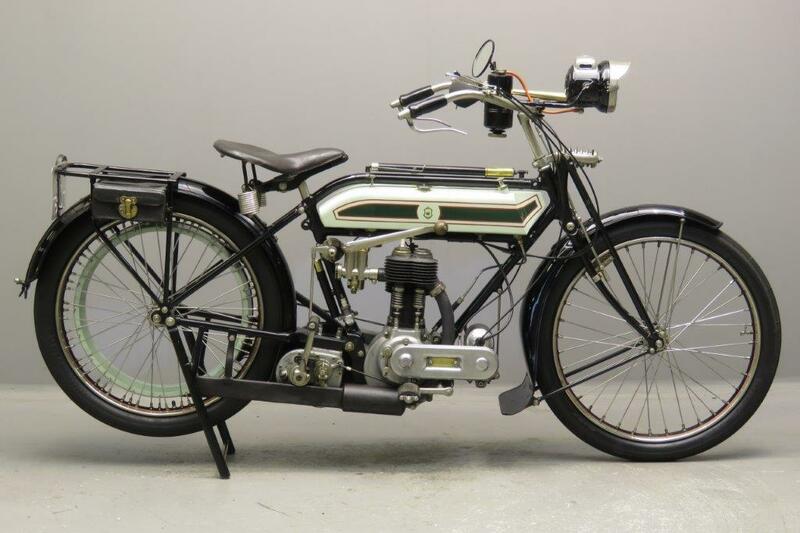 It is not until 1919 that the Model H is again available, in very small numbers, for the civilian market and many ex- army machines are sold off at surplus sales at Slough. A large number of machines are overhauled by the factory for resale in 1919 through 1921. For the 1920 model year the frame is strengthened and sidecar lugs are added. 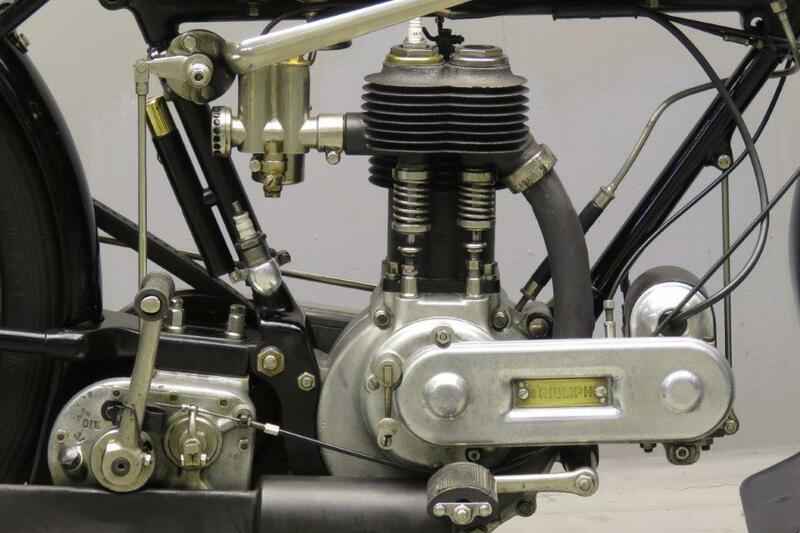 The big end bearing is improved by the use of a double set of rollers and the upper rear engine-to-frame crankcase mounting is made stronger by the addition of a rib. At the same time the external valve gear is redesigned. From 15 till the end of production in 1924 some 45,000 Model “H” machines are manufactured. The engine code refers to August, 1920 as assembly month. 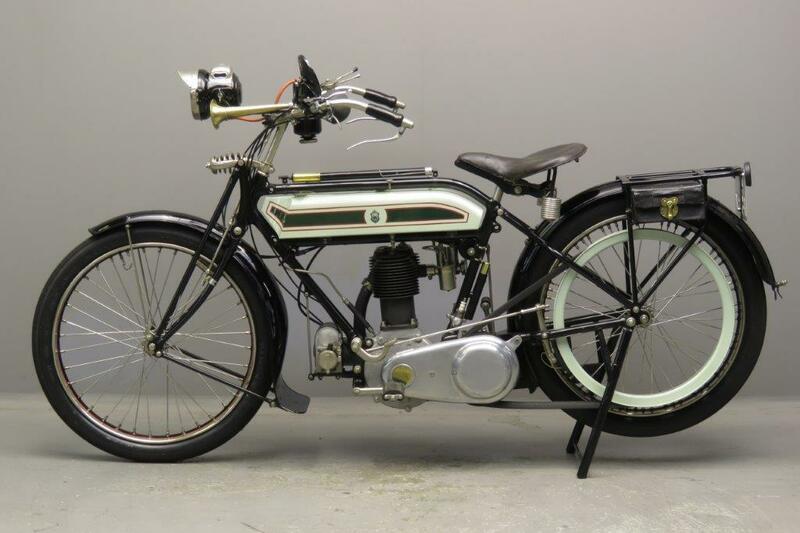 This practical vintage machine is a well presented older restoration.